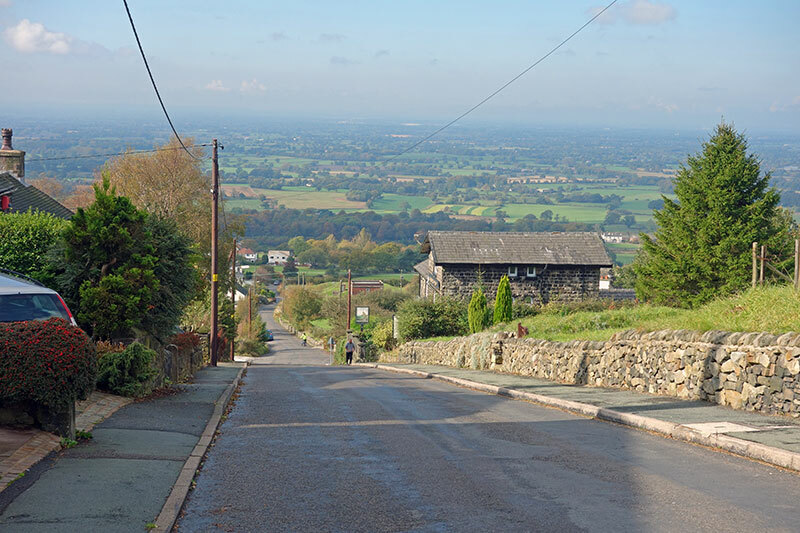 Sunday was the Lyme Racing Club hill climb up Mow Cop. 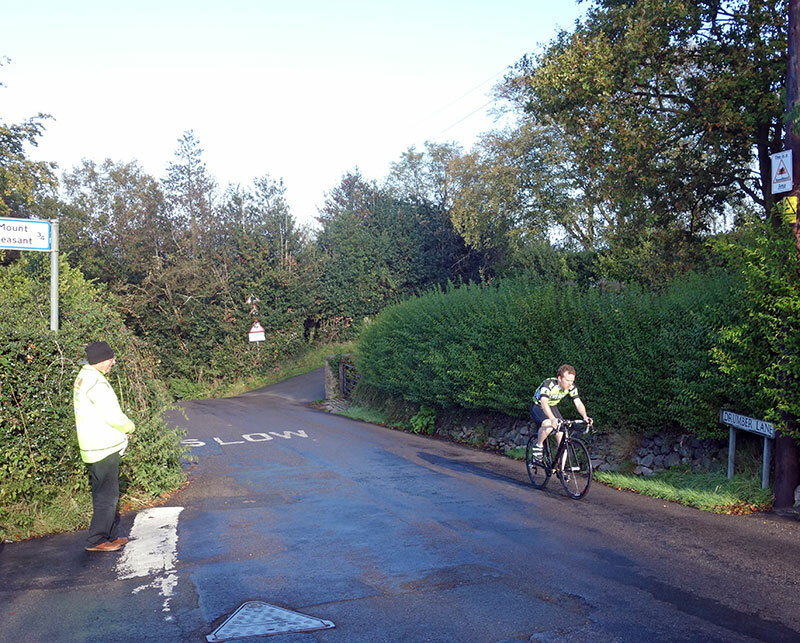 Mow Cop makes a spectacular hill climb as there is a real sting in the tail with a 25% uphill finish. It makes it quite a challenging mental as well as physical test. After coming out of the lower section, you can see the hill looming up above. Deciding how much to leave for the final section is a difficult decision. I fancied going down a gear just before the start of the steep section, but like last year, I was already in the lowest gear. Probably just as well, as the only thing to do is grin and bear it and hope you keep the momentum up that 23% slope. 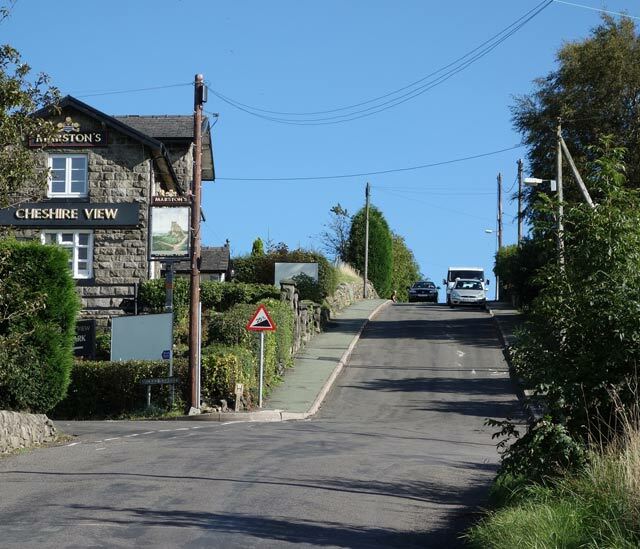 In hill climbs it’s always a difficult balancing act to get the right pacing, but Mow Cop presents a particular challenge. Great view looking down. You get a different kind of experience cycling up it. Last year, there was a persistent drizzle. This year, the weather was much better, though the hill was still wet, providing some minor wheel slip on the steepest sections. On the hill, especially at the top, there were quite a few spectators cheering the riders on. It was good to have a crowd to cheer you on. In the men, Joe Clarke (Team Zenith www.buzzcycles.co.uk), who is having an excellent season, finished in 3rd with 4.28. Next came M.Clinton (MikeVaughan.co.uk) who shaved o.1 seconds off the old course record from 2013 with a 4.22. The course record lasted just one minute 58 seconds; I managed to squeeze in front with a 4.20, to make another close finish. Like so often, another hill climb decided by a couple of seconds. 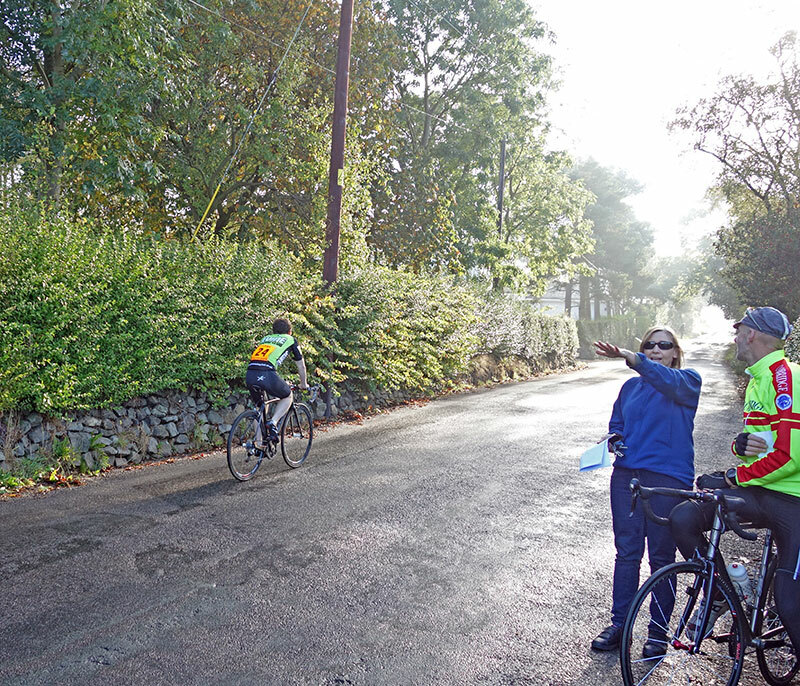 In the ladies, Nicola Soden (GBcycles.co.uk) was first and Helen Eborall (Born to Bike – Bridgtown Cycles) second. My memories from last year are quite vague. It’s interesting how you can quickly forget about what it was like to ride a hill climb. When you’re racing, you’re on the limit, but when you reflect afterwards you always think about how you could have gone faster. In particular I had the idea next time not to be intimidated by the steep section but go harder all the way into the last section. This is all wonderful in theory, a bit different in practise. My principle memories from last year were the rain, the steepness and getting to the start line and being a little embarrassed at my grey fuzzy socks I was wearing (last pair in draw). This year I had matching racing socks, and felt quite the part. I always worry about forgetting things – so throw three of everything into the car and hope for the best. It means I have bags and bags of stuff and can struggle to find what I actually need. My car pre-race is best described as ‘disorganised chaos’ – Lots of single items, few matching pairs. Apart from warming up in odd leg-warmers (one black, one white) it was quite a calm and enjoyable warm up. I arrived in enough time to go and watch some of the early starters suffering up the hill. It’s quite fun watching a hill climb, until you remember you have to do it yourself. The race went fairly well. A bit of wheel slip on the first section, but nothing serious; then it was trying to keep it going and hope you have enough left in the tank to make a big effort up the hardest part of the course. Just as you’ve got over the 25%, there’s 30-40 metres of 5%, but it feels like the hardest 5% you’ll ever do. It was a relief to finish. Will Corden and Lyme Racing put on another great event. A record turn out of 70+ riders. A nice innovation for the event was to see course records for women, veterans and juniors, a good idea for other events. Off the top of my head, I can’t remember what they were. But, will post results later. 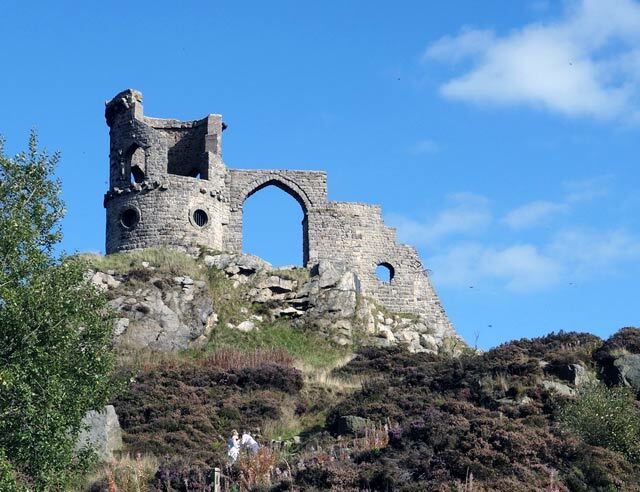 Mow Cop Folly. At the top of the hill. 5th = Chris Dyke (Manchester Wheelers) s.t. I made a short detour heading South on the M6 Junction 17 to climb this gem it’s only a short drive from the motorway and parking up in a quite country lane near Rode Hall country house posed no problems at all.This gave me a few miles to warm up and to see a little of the local countryside. Mow Cop is a really tough climb pretty much of the whole hill is visible before you and the 25% section looms towards the end section, so keep some energy in reserve.I launched an ‘attack’ to gain the momentum needed to get this part over and done with, it seemed to work. The view from the top is quite breathtaking. Well done Tejvan super times.